Note: TTouch is not meant to be a replacement for medical treatment. If your pet is experiencing a medical emergency, consult with your veterinarian or an Emergency Room (ER) veterinarian. TTouch animal massage (pronounced "T-Touch") was created by Linda Tellington-Jones in the 1970's when she studied a method of reducing physical pain in the human body. She initially developed techniques for horses (applied to Olympic jumping horses) and then for all animals. TTouch is used all over the world. Every pet parent (and vet tech) would benefit from knowing about it. It is very easy to learn the 15 or so different touches that make up TTouch. The simplest to start with is TTouch Ear Strokes. TTouch Ear Strokes is a very simple touch you can use to build a stronger bond with a cat (or dog) and it also helps if they are nervous, or get car sick, or do not like vet visits, or are experiencing some form of stress. Ear strokes are also important in an emergency situation. Please watch all three of the following videos as each one provides some important additional information. 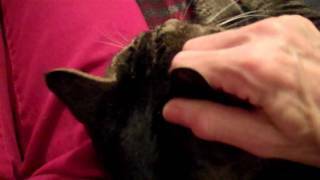 After you learn TTouch Ear Strokes, see below for videos of the other TTouch'es, or get the book Getting in TTouch with your Cat. "This is a demonstration of the ear TTouch, which can be especially soothing as there are many acupressure points in the ear. You will have to vary the pressure and tempo of the TTouch to see what is comfortable for your cat. This is a great touch to do on any cat but I have found in the shelter that frightened kittens especially respond to this TTouch." The following TTouch demonstration videos are by Sarah Hauser (New York City, NY, USA). Sarah is a trained Tellington TTouch Practitioner for Companion Animals, a Reiki Master with Special Certification in Animal Reiki (certified to do Reiki sessions with people as well as their pets), and is certified to treat people and animals with Bach Flower remedies. Sarah works with animals at various rescue organizations as well as privately. Text/Videos: Copyright © 2010-2013 Sarah Hauser, All rights reserved. "Here I am doing a TTouch Belly Lift with my sister Katie's cat Iggy. This is can be helpful for cats who may have digestive issues, but is also generally very relaxing for a cat who may be nervous. This is a very subtle, gentle movement,of the hand lifting the belly very slightly up, then a very slow release. This is not a medical treatment though so if your cat does have digestive issues make sure you consult a vet." "This is a demonstration of the Octopus TTouch, which can be very relaxing and can help connect the different parts of the body on your pet. Do not do this TTouch unless you are very comfortable touching your pet, as this can be too overwhelming for a shy animal or one that can get over-stimulated and possibly bite, etc." "This touch is called 'Tarantulas Pulling the Plough' and it can be a very good connecting TTouch. It can take a while to get the coordination. Be sure to do this quite lightly, you are not pushing hard into the back, but you are rolling the skin."